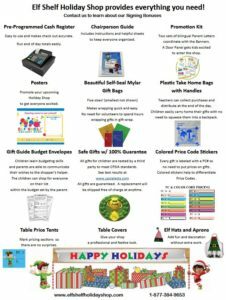 Elf Shelf® Holiday Shop provides everything a school needs to run a fun, successful holiday shop service project. Gifts are sent on consignment so no prepayment is required. Schools pay only for the gifts that sell after the sale is over. Gifts not sold may be returned for full credit. Broad selection of gifts priced $.25 – $12.50 with most in the $1 – $5 range. Gifts appeal to children shopping for Mom, Dad, Grandma, Grandpa and friends. If desired, schools may choose to have only gifts in specific price categories sent. All gifts, as required by law, are tested and meet the CPSIA testing standards set by the federal government. Test results are available by request. New gifts added each year with favorites from previous years still available. 100% Gift Guarantee – if at any time, a purchase needs replaced, simply contact us and a new gift will be shipped directly to the purchaser free of charge with no questions asked. Our goal is to send you plenty of merchandise before your sale, but when necessary, we send reorders UPS next day air. Has Arrived Parent Letters – Full color, bilingual letters for all students that go out just before your sale to remind children to bring their money and provides a place to announce specifics about your sale (can be printed on the back). Attach Budget Envelopes to these prior to distribution. Free use of a price-programmed Cash Register. Use it for your sale and return it when you’re done. Elf Shelf Holiday Shop pays the shipping! See promotions available this year! Free shipping is included both to get everything to the school and to return the leftover gifts to our warehouse. Explains what an Elf Shelf® Holiday Shop is as well as the benefits for children and families. Allows parents to view the types of gifts their children will be shopping for. Great tool to use in newsletters and on school websites for promotion purposes. Website is already listed on the Parent Letters provided with an Elf Shelf® Holiday Shop. See Elf Shelf® Holiday Shop parent website.